No, not those runs, you sickos. I mean that yesterday I took advantage of a break in the rain (because it is, after all, winter in the old Southern Hemisphere), and went on a run to take advantage of the gorgeous weather. The venue for aforementioned run: the various parques surrounding the National Museum of Fine Arts. The route traces a long quadrangle up Av. Presidente Figueroa Alcorta, back down Av. del Libertador, and back again. Aside from the Museo de Bellas Artes, the parks are dotted with sculptures and otherwise very picturesque. You know what I'm talking about. The appeal of this route it that it's relatively untrafficked and requires little in the way of street-crossing. That said, street crossing in Bs As is by far more efficient and much more dangerous than in the US (and esp LA, where what few pedestrians there are tend to defer graciously to traffic). This is a jaywalking kinda town, where peds simply dodge out in the street whenever they can, heedless of walk/don't walk signs. This suits me just fine, and added more than a small frisson of excitement to my run. I kind of expected to be the only runner out there. I supposed I thought of Argentines as the kind of people who would roll their sensualist eyes at strenuous American attempts at exercise. "Running?" I imagined the typical porteno saying, "The only running I do is when I am running out of the cigarettes and need to run to the tienda to get more! [Robust laughter.]" 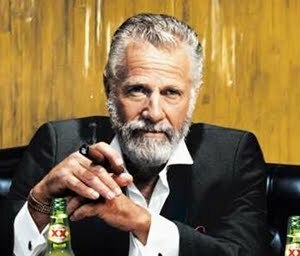 In my imagination, the speaker looks exactly like the dude in the Dos Equis commercials (e.g., "The Most Interesting Man in the World"). In fact, there were quite a few other runners on the park with me. None of them seemed exactly marathon-grade, but then again neither is DF (yet!). One dude, in true Latin-macho style, made a big show of passing me at high speed, and then amusingly (to me, anyway), became gassed and was sucking wind a half-kilo later when I passed him at my same, steady pace. I did not taunt him, save by internal dialogue. While on this run, I noticed that traffic along Av. F. Alcorta was backed up horrifically, and when I got to the far corner of the quadrangle, I realized why: the was an enormous demonstration. Political unrest? Revolution!?!? No. Fans of the football team River Plate had, for reasons unclear to me, gathered in the street and were chanting various slogans while waving club banners and jumping around. (NB to foreigners in Bs As: the two main football teams and rivals are Boca Jrs and River Plate, identifiable by the respective abbreviations/colors CABJ/Blue and CARP/Red). It may have had something to do with it being May 25, which is more or less the Argentine equivalent of the Fourth of July, and later led to some fireworks overhead that I could hear but not see from my apt balcony. I ran for almost an hour, and rated the experience a nearly unqualified success (esp b/c now I won't have to go about getting a gym membership, as I'd suspected I would need to, so further money saved). Only drawback: Running along two major arteries in downtown Bs As may not be as healthful as I'd hoped. All the while along these two traffic-choked avenidas, cars and trucks belch exhaust (it appears that Argentina's emissions control is not as robust as that in the good old USA). Small point, anyway. I look forward to future runs, and hope to beat my first-day record of five times around the parque. And as for runs of the other sort, I'll have you know that my GI has been rock-solid since coming to Argentina, despite my enthusiastic consumption of the local comida. Milagros, as the man says, pasan.